HomeHow does KickMagic prevent kickbacks? One very important by-product of the KickMagic pneumatic starter system is its ability to virtually eliminate harmful kickbacks. How is that possible? Well, first, let’s review what a kickback is. Kickback occurs when a piston is coming up on top dead center (TDC) on the compression stroke at the end of a kickstart attempt but does not make it all the way. Instead, the compression pushes the piston back down the cylinder in the reverse direction. As these types of engines all have advanced ignition timing, it means not only is there compression pressure pushing, but also the possibility of combustion pressure if the plug fires at the right (or more correctly, the most inappropriate) time in advance of TDC. This happens more often if the engine is not properly tuned. You feel it in a kickback. It’s the engine essentially trying to run backwards and anything in its path is subject to damage. This includes other engine and drivetrain parts (which is why electric starters with one-way sprags have slippage clutches or other devices to deal with it) and/or YOU! Torn Achilles tendons, jammed knees and twisted ankles are all part of the kickback “experience” and have left many an owner shying away from their machine. 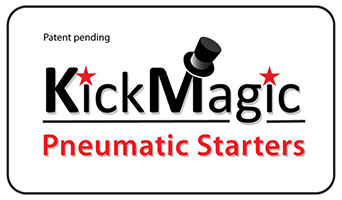 KickMagic uses a pneumatic actuator to assist the kick and then stays energized for several seconds after the kick attempt. If the engine starts or comes to rest without a kickback, then the system times out, vents and the kickstart returns to the ready position. 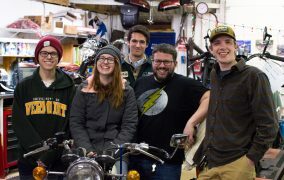 However, by definition, a kickback occurs when 1) the engine does not start and 2) at the end of the starting kick (remember, the piston has not reached top dead center because it ran out of kick energy). At this point, KickMagic’s pneumatic cylinder is fully energized with 100+/- psi of air. Should the engine kick back, it impacts this air cushion and not your body. And, by being an air cushion, it restrains the rotation in a soft way, preventing mechanical damage as well. 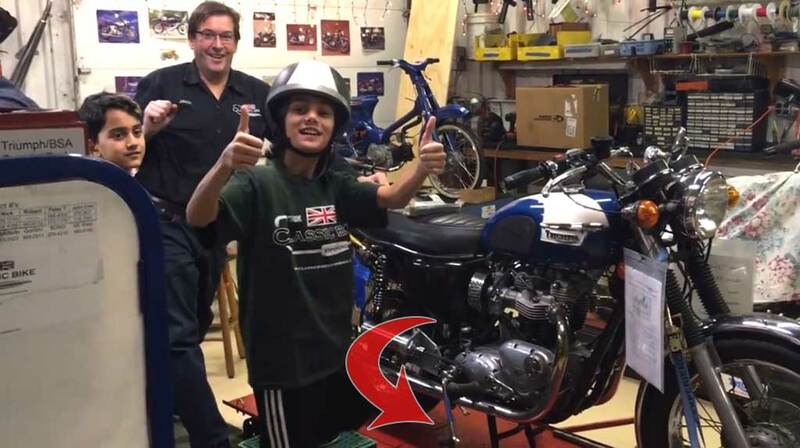 The nominal starter timeout for the Triumph oil in frame 750 KickMagic system is 5 seconds, sufficient time to attempt a kick and constrain a kickback. As long as the system is energized with air, the kickback is constrained. Note in the screenshot below from our demo video clip, the kickstart lever stays pinned after the operator (in this case, all 67 lbs of him) has completed the kick attempt. Please see the OWNER’S MANUAL for more information on proper starting techniques to take full advantage of this KickMagic safety feature.